Back in college, when I was having trouble falling asleep, I used to crack open my Economics textbook. It was as if the mere act of opening it sent up a flume of sleeping powder. I’d collapse head first into the book like I’d been chloroformed. I don’t think I’m alone here – there’s just something weird that happens to the body when you’re forced to do something that feels especially boring. Any energy you had leaves your body with the vigor of air cannoning out of a party balloon that hasn’t been properly tied off. I was reminded of this last night at the end of dinner. Lucy has been running a high fever over the last few days. To make staying in bed more interesting, we constructed a fort in her room. I used a rolled up rug we had as the tent pole. (“You just have a bunch of rolled up rugs in your basement?” my Irish friend Jason asked me. “What are you, a sultan?”). Over the tent pole we hung a big sheet covering the bed. 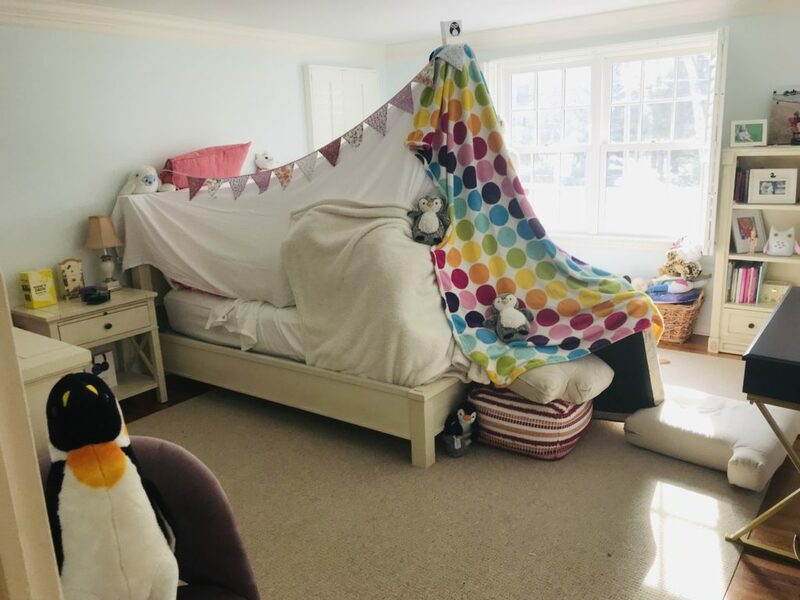 The kids named the fort Penguinopolis because they both love penguins. Liz stayed home with Lucy (taking care of her while simultaneously working a big job because Liz is awesome), and I came home a bit early to be with them, which brings us to the dinner scene. We were having a grand old time, telling stories and such. It culminated with Lucy retelling the story from the day (more on that later). She was giggling and Lizzie was goofing around with her and we were all happy and whatnot. Things were good. And in that moment – that very instant – Lucy went from happy giggly girl to looking like she had just been tased. Immediately her headache came rushing back. Now, in fairness, of course her head was killing her. She had a fever of a billion and five and she had been sweating molten lava all day. But the thing is, two seconds earlier she had been fine. Her energy was way up for the Fun, way down for the Not Fun. Just like me and my Econ textbook. This brings me to Finn and math homework. Neither kid seems to hate math, which is pretty great, and the opposite of how I was when I was kid. Lucy’s 2nd grade homework was pretty straightforward and only took a couple of minutes. Finn’s 4th grade homework was getting complicated. So I told Finn that I was committing to going over his math homework with him every night. And he totally lit up. Ever since then, I’ll come home from work and we go over the math homework, which he’s already finished, and we check his work together. It makes me feel like one of the Dads in the Make-Time-to-Be-a-Dad-Today commercials which are the only commercials that make me tear up. I don’t recall my own 4th grade math homework. 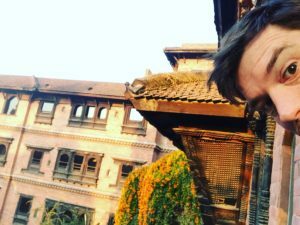 But my guess is that when my parents offered to check over my homework with me – especially when I had already finished and could be doing something fun? – I probably slumped over like Lucy when we asked her to help clear the table. I would probably wail in agony at spending additional time on my homework. I would likely have brayed like a Tusken Raider on the desert planet of Tatooine, shaking my gaderffii (my traditional melee weapon, its hook tipped with the venom of the common sand bat) at Luke Skywalker, leaping off my domesticated bantha to stand over him in order to establish myself as the alpha. In those moments I would tell my parents that I was too exhausted. Or that I felt sick, or that I had a cold or the flu or mono or fowlpox. But when I’m sitting with Finn and we’re doing math together? Finn actually perks up. It’s like we’re playing video games together or something. He’s super excited. And what’s more, I’m super excited too. I really enjoy it. Like, I’d rather be doing that than anything else at that moment. (Except touring a Snickers factory which is my all-time dream in case anyone knows a guy who knows a guy). That’s the point – you can’t fake that. Finn fancies himself a problem solver, and I think he likes to show me he can solve problems. And when we are working on something together, a lot of challenges that felt difficult suddenly feel not only possible but actually exciting. I hope Finn is somehow left with good memories of math homework, in the way I have great memories of writing papers in middle and high school because it was a chance to connect with my dad, a writer and English professor. It’s what made me fall in love with writing. I don’t know how long these times last – sitting at the kitchen table doing math homework with your son. Or how long he will think that’s something exciting rather than annoying. But I’ve recently grown to love math, because I love that, it this unexpected little way, it connects me with my son. So yesterday Lucy is home sick. Fever of 103 temperature. She’s miserable. But good news – her favorite thing in the world, her puppy Beasley, wanders into her bedroom – into Penguinopolis. Beasley loves being with Lucy on Lucy’s bed. So this made Lucy happy. Beasley climbs on the bed and cuddles up to Lucy. Then Beasley barfs all over her. So it wasn’t a great day for Lucy. That Star Wars integration – seamless! Oh but in the puppy story you forgot the part about the person who had to clean it all up. You are a great homework-helping dad, love. You are the total big hero mom! And cleaning up Beasley, that gets you a gold star, love. I’m going to do everything I can to stunt his growth. Now it’s time to ask ourselves, how is Yoda so alpha, or is he? I sure love Yoda. Thank you for the post. Yoda is timeless. Love Yoda. In our house, there was an unspoken rule: Mom cleans up the barf and Dad disposes of rodent cadavers. That’s not a terrible distribution right there. I agree that a good parent will be aware of their child’s homework, what they’re learning, how they’re doing, whether or not they’re doing it…but I disagree that a “good” parent “should” be doing it with them. I think you were right the first time – it’s between them and their teacher. Unless they are having difficulties, it’s a good thing for them to do it on their own. It teaches them independence and responsibility. Or maybe I’m misunderstanding what you mean by doing it with them…Anyway, hope Lucy (and Beasley) are feeling better! No, I agree – they do their homework first thing when they come home, when I’m going over it with them it’s mostly them showing me what they’ve done. But it also reminds them to check their work and most importantly it makes homework fun and shows them we’re invested with them. 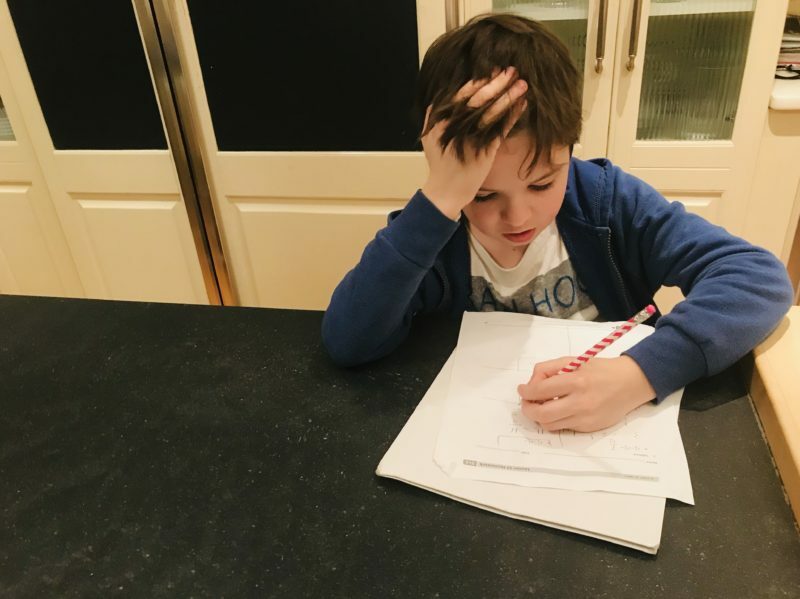 We’ve seen huge growth from Finn when we’ve gotten involved with his math homework! Ah Math!!! Grand memories. Not. But you’re making good ones. Bravo Conor. Hope Lucy better. Beasley too. Long division is so much different now. I just watch him do it. It’s crazy. My children remember that every night I read to them. No matter how busy our lives were, mom reading was special time to spend with each child. Now I find joy in tutoring young students, grades 1-4, in math or literacy. As they make progress and gain confidence, it is a joy for me to tell the parents my services are no longer needed. My own children did not want me, “the teacher” doing homework with them. Reading to them was different. I love that! And yes, reading they will do for fun, all day, by themselves. Totally with you. My unsolicited advice – I adopted a young boy this year, a former student. I have three grown daughters, and a granddaughter, its been a while since I did the homework thing. When the math doesn’t make sense to me, I politely excuse myself, sneak off with the laptop and google Kahn Academy – fantastic tutorials on everything math – the kid thinks I’m a genius. Keep Kahn Academy close by – better yet, check what math he’s doing and study on the commute home. Golden. Hey Conor! I actually know a guy! 🙂 I could POSSIBLY make your Snickers dream come true if you’re willing to travel to Kansas!Lol!